The best cookware is what you need if your serious about your cooking. 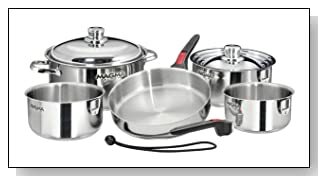 If you just like to have good quality cookware in your kitchen, then you need the best cookware set that you can afford. Good quality cookware is easier to cook with, easier to clean and lasts longer. Now you probably fall into one of two camps. Those that prefer non stick cookware and those that like to work with stainless steel. Either way top quality pots and pans are important and make a great gift too. If you know a couple that are moving into a new house or apartment a great set of good quality cookware is a fantastic way to get them started in their new home. We have listed here the most popular quality cookware available right now. So if you are looking to buy a new set of pots and pans you have probably seen that they can be made from all sorts of materials and you are probably left wondering which type is best for you. 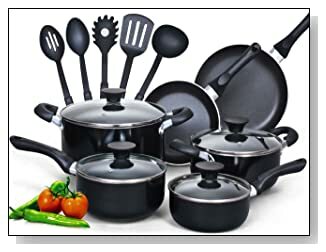 Anodized, hard anodized, non stick, stainless steel, copper and more are different type of pots and pans that you have likely seen on the market. Lets try and find out a bit more about the various types that are out there and how well they will work for you. Choosing between these various types of cookware can be quite difficult. The price doesnt help either as there are all sorts of pots and pans available at a range of prices. But the different types of cookware have different properties and different situations they are best for so it really comes down to how you use your cookware and what is more important for you. Copper pots and pans tend to have copper on the outside and then tin or stainless steel on the inside. The benefit of copper is that it has excellent heat conduction and because of the copper coloring it looks really good in your kitchen too. The downside to copper is the high cost in that it is expensive. Also copper does tend to react with acidic food and will require polishing as it will lose its color. 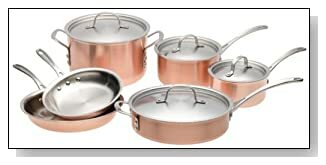 A great copper cookware set is this 10 piece Try Ply copper set from Calphalon. The design of the pieces in this set combine the brushed copper outside to the aluminium core which give great heat transfer and even cooking too. A non reactive stainless steel interior gives a nice cooking surface thats also hard wearing. Brushed stainless steel lids that fit perfectly also keeps in the heat and moisture for great cooking. The rims on these lids are also designed to be flared for durability and easier pouring. 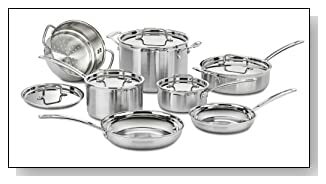 This set features 8 inch and 10 inch fry pans, 3 quart saute and, 1 1/2 2 1/2 and six quart saucepans. These also feature Calphalons stay cool handles and are also oven safe to 450 degrees F too, which makes them even more versatile. These are great for those that like to cook as they give great results with the even heating, work well at high heats for searing and low heats for gentle warming too. Customers have found these pots and pans to be quite durable, high quality and fairly resistant to scratches and the wear and tear of daily use. That being said, all pots and pans are going to scratch and wear over time if they are being used so there is not getting away from that. Customers also love the fact that this cookware set conducts heat really well and also cooks fairly gently and evenly, but does take a while to heat up. Bear in mind that copper will discolor with regular use so may need some polishing to keep it looking at its best. Customers also noted that these cook really well on ceramic cook tops so if you have those these might be a good choice for you. Nonstick pots and pans have a special coating to ensure that food doesnt stick and this works especially well when cooking. Unfortunately non stick coatings can release some harmful gases at higher temperatures that are especially harmful to birds, so if you have birds in your home stay away from non stick coated pots and pans. They are extremely easy to clean, but the coating is not durable and can easily flake and score if scratched and damaged by sharp objects so metal cutlery or anything abrasive should be avoided with non stick pots and pans. 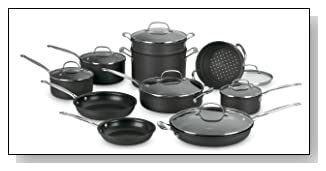 If you want a great non stick cookware set then here is a great 15 piece option from Cook N Home. Tempered glass lids and large sturdy handles on them are easy to grab and easy to see the food while it is cooking. Mage from a heavy gauge aluminium these pots and pans provide nice and even cooking throughout. This also features a great non stick coating that will perform will. These also come at a great price that is value for money. This cookware is also designed with nice looking soft touch handles that is designed to stay as cool and possible and with silicone to make them less slippy too for safety. This include a 6 quart Dutch oven, 3 quart casserole pot, 2 quart sauce pan, 1 quart sauce pan, 10 inch fry pan, 8 inch fry pan and five nylon tools. This is a nice heavy duty set that is easy to clean and gives even cooking performance. The grooves in the bottom of the pots also ensure that they wont slide around when cooking too. Aluminium is another great material to use for cookware as it is easy to mould, which is why its popular for baking cookware. It conduct well and doesnt corrode and also is reasonably priced. But its easy to scratch and dent and also reacts with food especially acidic food so you should not keep food in aluminium pots and pans for too long once cooked. Anodized and hard anodized aluminium pots have been treated in a special way so that the surface of the aluminium reacts and builds up a special coating that doesnt react with the food, is tough and also non stick. The surface will wear down over time but it still makes a better alternative to standard aluminium pots and pans. 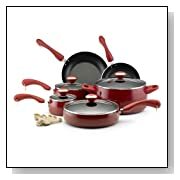 This set from Cuisinart is made from hard anodized aluminium and has a quantanium and titanium reinforced non stick finish. Stainless steel handles are also featured and crack resistant lids too. 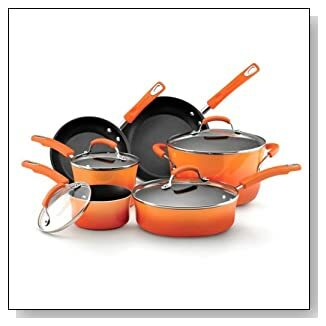 With this set you get 1 1/2 quart, 2 quart anbd 3 quart saucepans with lids, 8 inch skillet, 10 inch skillet, 12 inch skillet with lid, 4 quart lidded pot, and 9 quart lidded stockpot, plus 7 3/4 inch steamer insert and 9 1/2 inch pasta insert too. This hard anodized cookware is claimed to be harder than stainless steel to give it superior durability. The exterior has the hard anodized surface over the aluminium core and the Quantanium interior to give a quality non stick surface. These also feature riveted contoured cool grip handles that are designed to be easy to hold to keep everything secure while cooking and moving your pots around. Also tapered rims ensure that the cookware is durable and yet also helps to make them easy to pour from too. Stainless steel pots and pans are very popular and they look good, are very hard wearing, dont corrode or get rusty. The downside is that they dont conduct heat as well as some materials which is why you often find stainless steel pans fitted with a copper bottom to get over that. This top quality 12 piece stainless steel cookware set from Cuisinart in triple ply stainless steel comes with an aluminium core that runs through base and sides of pans for improved heat conduction, brushed outside, and a mirror like finish on the inside. Riveted stainless steel handles designed to look good but also to give easy and comfortable control and stay cool for easier and safer handling too. The stainless steel lids are designed to be a snug fit to keep keep and moisture in the pots. For extra versatility this cookware is also oven safe and broiler safe to 500F too. This cookware set comes with 3 quart saucepan, 1 1/2 quart saucepan, 8 inch skillet, 10 inch skillet, 3 1/2 quart saute pan, 8 quart stockpot and a steamer insert too. This is nice looking and modern cookware for the home chef that really likes to cook. This set is designed with no coatings or coverings so there is nothing to wear out or melt away or get chipped. Tapered rims make it easy to pour from this set with minimal dripping. The beauty of stainless steel cookware is that it does not react with food like some materials, so you food will not have a hint of the taste of the pot it was cooking in, just the taste of your food. Non stick cookware is probably the most popular for pure convenience, but stainless steel is what you buy if you want cookware that is going to last you a long time, is able to take lots of heavy abuse and us for yeas to come and still perform just as well, and is ultimately very easy to clean without having to worry about scratching of any special coatings. Also stainless steel is usually perfectly dishwasher safe which makes it very convenient to clean up. What do most professional chefs use where they cook either for work or at home. Its generally stainless steel for the reasons mentioned above. 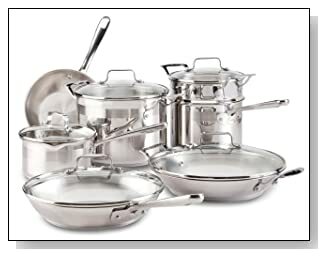 And Cuisinart is one of the top stainless steel cookware brands. Customers love the handle design and aldo the tight fit of the lids is popular too. Customers also love the fact that this cookware set just plain looks awesome in your kitchen, and is probably a good reason to by a pot rack just to keep them on display. The top build quality, durability, versatility and ease of use make this a great choice for stainless steel cookware. This top rated cookware set currently scores 4.7 out of 5 stars in 140 customer reviews on Amazon.com. Cast iron cookware has been around for many years. Its hard wearing, conducts heat very well and often lasts a lifetime. But it does need maintenance to stop it from rusting. Enamelled cast iron solves this problem by coating the cookware with a layer of enamel, but the best of this type can be very expensive. Also cast iron is very heavy, so not the kind of cookware you want to be moving around very much, especially when full of food. This entry was posted in Cookware and tagged best cooking sets on the market, best cookware set 2016, best cookware set under 200, best copper cookware, best non stick cookware sets 2016, best rated cookware, best rated cookware 2015, Best Rated Cookware Sets, best rated cookware sets 2016, best rated pots and pan sets 2016, best rated pots and pans 2016, Highest rated cookware sets 2016, professional cookware sets 2016, top cookware sets, top cookware sets 2016, top rated cookware 2016, top rated cookware sets to buy, Top rated cookware to buy, top ten rated cookware sets 2016 on January 27, 2013 by Jeff.